Us Europeans are finally getting the hang of this high-definition TV stuff. Interest is rocketing and adoption rates are expected to boom. For a variety of technical and geographical reasons it has taken some time for Europeans to adopt HDTVs in the same way that those in Japan and the US have. But the market is finally taking off, a study by research firm Forrester shows. Across Western Europe, around 55 per cent of online consumers know what HDTV is. In the UK this figure is even higher; only 7 per cent claimed not to know anything about HDTV. Strong interest from broadcasting companies such as BSkyB and the BBC , combined with a national tendency to buy new technology, were cited as reasons for the high awareness in Britain. So far, the relatively high prices and lack of perceived need are holding back mainstream adoption, Forrester said. Price is the major adoption barrier for many consumers. Some 59 per cent of European consumers who are aware of HDTV, but aren't interested in getting a set, reported price as the main reason. 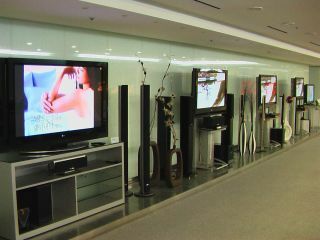 But 74 per cent said they would consider buying an HDTV if prices were lower. Lack of need also hinders adoption. A new TV is a major purchase and often slips down the list of buying priorities. This is clearly the case for the 45 per cent of HD-aware but disinterested European consumers who said they don't need a new TV. Furthermore, 31 per cent of these consumers also think that an HDTV set is unnecessary, while 13 per cent considered the benefits of HDTV to be unclear. Early adopters of HDTV tend to be well-informed, affluent and mainly interested in getting a new flat-screen TV for technology's sake, rather than for actual HD content. As with most TV-based services, level of education is not a key differentiator for owning a HDTV.